Imagine using your computer to listen to the radio? And it is FREE! It may seem like a strange thing to do, but by putting the programming online, Search Okinawa Radio is able to now reach the global audience in Peru, Brazil, USA, Canada, Australia, New Zealand, France, Hawaii, Europe, China, Taiwan, Philippines and even Japan, Nationwide! Let's say you just moved to New York from Okinawa and long for some Okinawa related music and information. Listen to a variety of Okinawa related music from SOR (Search Okinawa Radio) at www.SearchOkinawa.com right over the Net. Best of all, Search Okinawa Internet radio puts you in control. You can listen to what you want, when you want. The technology that makes this all possible is called streaming audio. "Streaming" means that you don't have to download an entire audio file before the music starts to play. To listen to Search Okinawa radio online, your computer must be equipped with a sound card and speakers or you will need headphones. Then you may download thier fast and easy player plug-in for your web browser. If you're not sure what this is or you want to know how to install it just click our link to listen and you will be taken to a listening wizard that will do all the work for you. Audio players work adequately with a dial-up connection, but just like the rest of the Net, the faster your connection, the better the results. 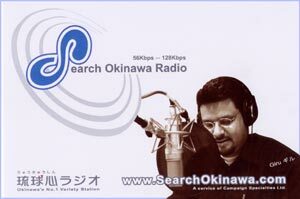 Search Okinawa Radio from the heart of the Ryukyus can be found at www.searchokinawa.com.